I love some of those commercials that show an item, then list the price of something and, at the end, list something that is priceless. That’s our redemption: priceless! 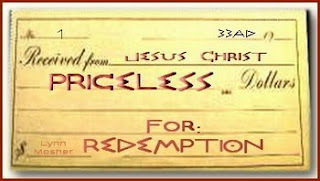 Priceless…in the sense that we could never repay Christ for the redemption we have received. But for Him: a very costly price. His life. But still…an unmeasured, priceless gift to us. You are that special friend of Jesus; you are worth every drop of blood that He shed and paid for you. If you have accepted that sacrificial offer, you are the precious Bride of Christ, the Beloved Bridegroom. The Greek word for ransom, in the above verse, is used only this once in the Bible and means the redemption price of a slave or captive, that which is offered in exchange for another. The Greek meaning of the word used for redeem, I think, beautifully describes what Christ did for us. It means to ransom, to rescue one from loss to improve opportunity, to purchase one for his freedom from another’s power by paying a price to recover him, or to buy up for one’s self or own use. Great agony and heartache were the price of your redemption. Truly you are not your own. You were bought with a price. May you know that Eternal Life that surges through your precious, blood-bought soul. And may the Lord reveal to you His presence in some special way this Easter season.